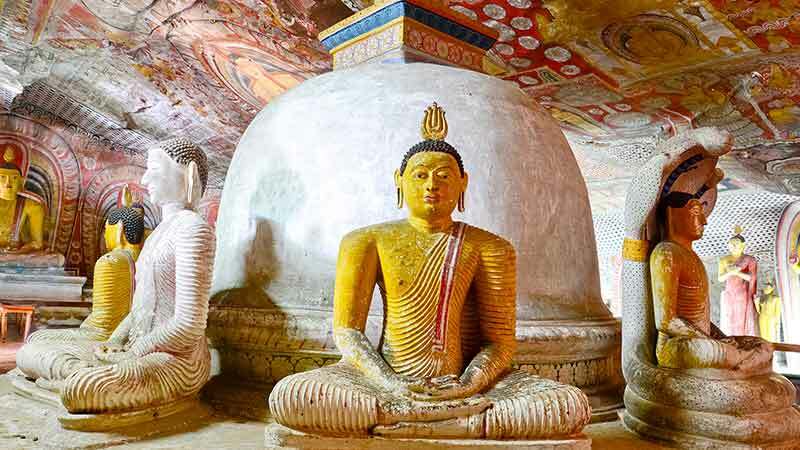 If you are an enthusiastic traveller wanting to truly gain deep insights into local history and Buddhism and how it is linked with the island’s culture, our Sri Lanka cultural triangle tour is the perfect choice. Explore the most renowned sacred cities of Anuradhapura, Polonnaruwa, Dambulla, Yapahuwa and Kandy with us & and take the Buddhist teaching with you…… You are sure to be enlightened! The package is originally designed for 07 nights / 08 days. However, we are always happy to cater to our valuable clients’ requirements and therefore, it can be customised for different durations as per request. After arrival an NKAR representative will welcome you at the airport and proceed to Negombo. Relax after checking in to the hotel. Anuradhapura is one of main ancient kingdoms in Sri Lanka which goes back to the 5th century B.C. Visit all the ruins of the kingdom and sites of special interest including the sacred Sri Maha Bodiya and Isurumuniya Temple. This sacred city was established around a cutting from the ‘Tree of Enlightenment’, the Buddha’s fig tree, brought there in the 3rd century B.C. by Sanghamitta, the founder of an order of Buddhist nuns. Anuradhapura, a Ceylonese political and religious capital that flourished for 1,300 years, was abandoned after an invasion in 993 AD. Hidden away in dense jungle for many years, the splendid site, with its palaces, monasteries and monuments, is now accessible once again. Arrive in Trincomalee and check-in to the hotel. Mihintale is where Buddhism was first introduced to Sri Lanka. Mihintale is regarded as the cradle of Buddhism in Sri Lanka. The rock is home to many shrines and rock dwellings. A grand stairway of 1,840 steps made out of granite slabs 15” wide leads to the summit from where one could get a splendid view of the surrounding countryside. After breakfast enjoy an elephant back ride in Habarana. Then proceed to Polonnaruwa, one of the main ancient kingdoms in Sri Lanka. The magnificent 5th century A.D. rock-fortress citadel of a fugitive king, where history merges with melodrama. A gallery of frescoes of shapely be-jewelled maidens still glows with vibrant colour. It is believed these paintings depict the “apsaras” or goddesses and some say it represents the lightning and clouds. Another distinctive feature of Sigiriya is the Mirror Wall which is located just below the paintings. The surface of this wall is well polished and covered with writings known as “Sigiri Graffiti” which are a form of poems. The Lion Staircase leads to the summit and the special feature of this is the massive Lion Paw which is carved out of rock. The brick wall is still preserved in its original form. Sigiriya is being currently excavated and restored by UNESCO under the Cultural Triangle Project and according to sources is most likely to be declared as a Wonder of the World. Then visit Kandy via Matale where you can find spice gardens. Visit the Temple of The Sacred Tooth Relic in the evening. Kandy ‘s main attraction is the Dalada Maligawa, the Temple of the Sacred Tooth Relic of the Buddha brought to Sri Lanka in the 4th century AD. This sacred relic has ever since been the symbol of sovereignty for its rulers and is always enshrined in great splendour. If you are visiting Kandy during July-August, a definite must see is the Esala Perahera, known to be one of the most popular Sri Lankan events. Termed as Asia’s grandest pageant, this spectacular annual event is held to honour the Sacred Tooth Relic of the Buddha and to obtain blessings of the guardian deities of Sri Lanka. After breakfast visit Gadaladeniya, Embekka and Lankathilake temples. In the evening do a city tour in Kandy and visit the Royal Botanical Gardens. After breakfast in Kandy proceed to Colombo. On the way to Colombo visit Pinnawala Elephant Orphanage. Colombo is the commercial capital of Sri Lanka – it is the traditional gateway to the Orient. Colombo which has a population of over a million distributed over fifteen zones, has three main zones, each of which has a distinctive character. Fort, the centre of metropolitan activity, Pettah the bustling bazaar area and the old Cinnamon Gardens, now fashionably known as Colombo 7 with its spacious mansions and better residential areas.